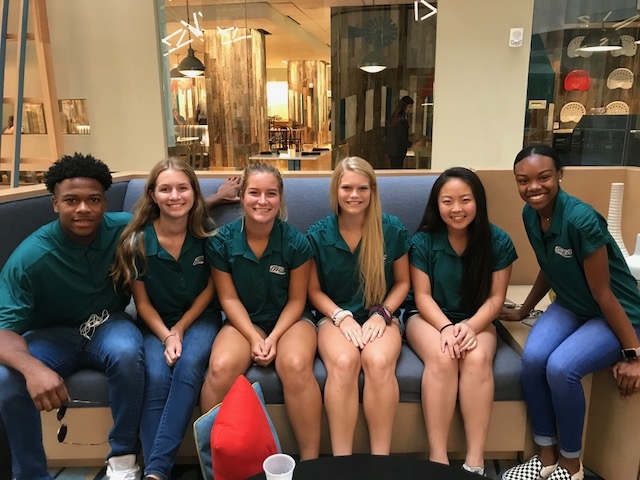 Six student-athletes from several GHSA member high schools attended the National Student Leadership Summit hosted by the NFHS July 23-25 in Indianapolis. Wakana Sato from Starr’s Mill, Logan Reid from Vidalia, Lindsay Tillman from Thomasville, Ellen Conley from Allatoona, Ashlynn Anderson from Upson-Lee and Justin Harris from Peach County were the students in attendance. The NSLS focused on relevant and contemporary issues that affect today’s students in athletic-based athletics and performing arts. By utilizing a “train the trainer” concept, each student ambassador learned ways to develop and maintain healthy relationships with teammates, coaches/adult leaders and officials. Each learned ways to become better communicators and ideas in conflict resolution. During the summit, the state attendees met to discuss ways to lead their schools in Georgia. Sportsmanship has been deemed as the main topic for the Student-Athlete Advisory Council this year. For more information on the Student Leadership Advisory Council, contact Penny Pitts Mitchell at pennypitts@ghsa.net or Tanya Anderson at tanyaanderson@ghsa.net. Pictured below (L-R) are Justin Harris (Peach County), Ashlynn Anderson (Upson-Lee), Logan Reid (Vidalia), Ellen Conley (Allatoona), Wakana Sato (Starr's Mill) and Lindsay Tillman (Thomasville).